Budget Director Shawn Sullivan outlined Gov. Sam Brownback’s budget proposal Wednesday at the Statehouse. The governor’s proposed budget continues to rely on one-time fixes. 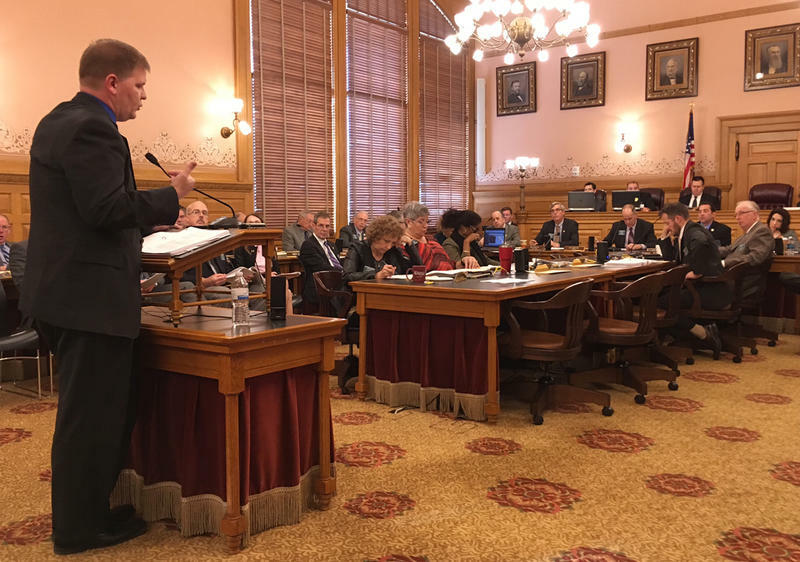 Kansas Public Radio's Stephen Koranda talks with Kansas News Service reporter and editor Jim McLean about the Kansas budget plan and how lawmakers are reacting to it. Gov. Sam Brownback’s office released a budget proposal Wednesday that is likely to put him at odds with large swaths of the Legislature. Legislators in both parties won re-election last year on platforms that included repealing a state income tax exemption for business owners and providing a state general fund that balances annual spending with tax revenue and doesn’t rely on one-time sweeps of other money. The proposal outlined Wednesday by State Budget Director Shawn Sullivan barely alters the tax exemption and does not balance the general fund until 2019. Sullivan told legislators the tax exemption is a valuable economic development tool and cutting spending to match tax revenues remains unrealistic while the state’s farm and oil industries languish. Brownback’s budget continues to rely on one-time fixes like sweeps of the highway fund, further deferments of payments to the state employee pension plan and the sale of the Kansas Bioscience Authority. He also proposes selling the state’s annual payments from a legal settlement against tobacco companies for a lump sum payment. Several legislators have called that a non-starter. To solve the immediate budget deficit — about $350 million before July 1 — Brownback proposed tapping a long-term investment fund and paying it back over the next seven years. “(That’s) to get through this year, in order to protect us from major cuts halfway through our fiscal year or other options which we don’t believe are feasible,” Sullivan said. Legislators want to consider other options. Key Republicans like Rep. Steven Johnson, chairman of the House Tax Committee, and Senate Majority Leader Jim Denning told the Associated Press they favor a quick repeal of the 2012 income tax exemption, which would net an estimated $260 million in annual tax revenue. Brownback’s proposal would restore the state income tax only on “passive revenue” like rents and royalties, bringing in an estimated $40 million. One cut Brownback proposed reversing was a 4 percent reduction imposed on most Medicaid providers last year. Sullivan outlined a package deal to raise fees on hospitals and on the three managed care organizations that administer Kansas Medicaid, or KanCare. In exchange the state would reverse the 4 percent cuts as well as invest in more medical residency slots, a new osteopathic medicine school and a dental school. Rep. Dan Hawkins, a Republican from Wichita who chairs the House Health and Human Services Committee, said the extra investments might “sweeten the pot” enough to get legislative approval for the hospital fee increase. “There is going to be some resistance to the hospital assessment fee, but with some of the things they are proposing I want to hear them out,” Hawkins said. Kansas Gov. 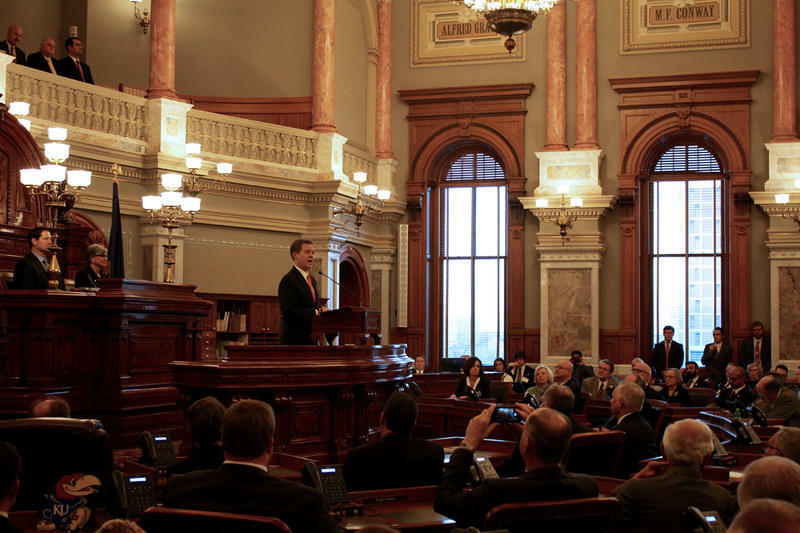 Sam Brownback began a quest to preserve his legacy with Tuesday’s State of the State address. Facing an immediate budget crisis and a Legislature rendered more oppositional with the ouster of dozens of allies in last year’s elections, Brownback used the 30-minute speech to try to reassure Kansans that the right-wing policy path he has blazed the last six years is worth maintaining.